Private Reserve's Lake Placid Blue | Inkdependence! Anyway, Lake Placid is a pretty average blue. It's not as deep as Liberty's Elysium. It's not as bright at Naples Blue. It's doesn't shade like the Iroshizuku blues. It's a solid blue blue of the medium blue variety. I quite like it, even if it isn't a standout in my collection of blues. As you can see, there is a pretty massive difference between the scanned image on the right and the photograph on the left. I would guess that this has something to do with the type of light hitting the page. In natural light, this ink is a throughly medium blue, but under the bright LED of the scanner it becomes far lighter. I'd say that the photo is probably closer to the real color in my experience. 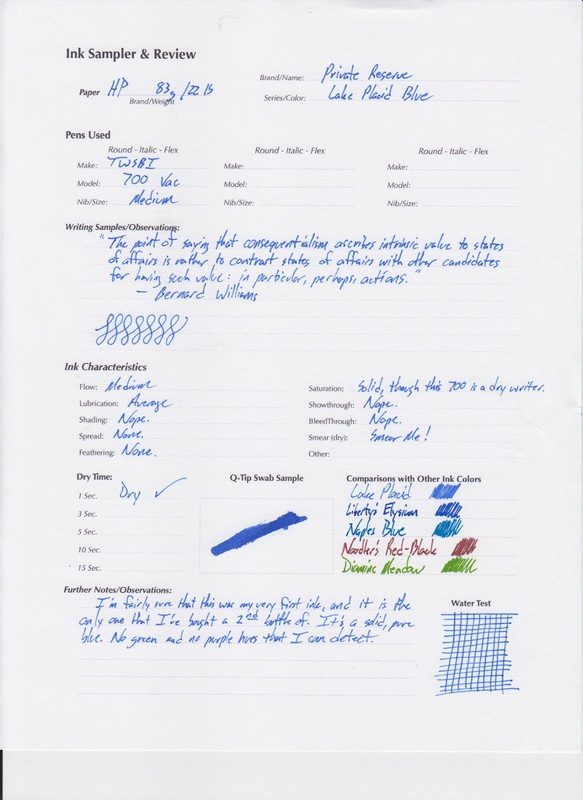 This is a saturated blue that doesn't shade, and if it looks this good from the dry nib of a TWSBI, then it looks even better when you have a nib that will really put down some ink. That ink won't stick around if you get it wet, though, so watch your coffee mugs around it.